SHIPS are responsible for nearly a third of the world's nitrogen oxide emissions. 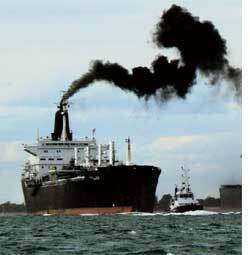 Shipping is also believed to contribute to as much particulate matter emission as road traffic, globally. For example, it emits soot or black carbon, which is a stronger warming agent than CO2. Black carbon is responsible for a quarter of all Arctic warming. It is also known to lead to adverse health effects, reduction in visibility and premature mortality. David Lack, at the earth system research laboratory, National Oceanic and Atmospheric Administration (noaa), US, and other researchers from US, UK and Switzerland, tried to quantify the amount of particulate matter and gases emitted by ships to come up with some accurate data. An noaa research cruise sampled commercial ships for two months in 2006. The plumes of smoke emitted by 211 ships were recorded, along with other relevant data like ship size, commercial type and speed. The results showed that composition of particulate matter was found to depend on a number of factors: the sulphur content of the fuel used, engine type, vessel activity and maintenance. Ocean-going ships contain slow-speed diesel engines which burn low-quality fuels containing large amounts of sulphur and heavy metals. Smaller vessels like ferries and fishing boats operate medium-speed diesel engines whose emissions meet the requirements of the Environmental Protection Agency, US. The larger commercial ships, however, are in violation of it. The most commonly released greenhouse gas is carbon dioxide and ships account for 3.3 per cent of the total global emissions. The study found the global annual particulate matter emission from ships to be 0.9 gross tonne per year which included direct emissions of sulphur dioxide (46 per cent), organic matter (39 per cent) and black carbon (15 per cent). The study was published in the February 25 issue of the Journal of Geophysical Research-Atmospheres. The simplest way to decrease emissions would be to reduce the speed of ships. Studies have shown that a reduction of 10 per cent in speed would result in 23 per cent decrease in emission. Other measures include using cleaner fuels and redesigning relevant parts of the vessels to maximize efficiency.